Plasma TVs vs LCD/LED TVs – The Gap Is Narrowing! – Belco Inc.
is not as true today as it was then; specifically, the part about spending a lot of money. What was the latest technology back then is now basic and included on most of the lower end LCD TVs. If you are looking for the “top of the line” best picture, plasma is still where you want to start; but, it may not be what you end up with. Energy conservation efforts are driving technology to LCD/LED TVs and away from Plasmas. I’ve actually seen some inexpensive plasma TVs with worse pictures than comparably priced LCD TVs lately, which surprised me a little. Energy saving measures are being incorporated into Plasma TVs produced today that cause the pictures to be dim in comparison to older Plasmas and many of today’s LCD TVs. So basically, Plasma TVs aren’t being allowed to perform to their full potential due to energy conservation regulations. Picture quality is much better than it used to be on LCD TVs, even on the lower cost ones. 1080P is not the new thing anymore. A lot of “basic” inexpensive TVs have this technology now. Plus, they are thinner than they used to be, so the picture quality is not affected as much when you look at it from an angle. Also, stores are not carrying as wide a selection of Plasma TVs as in the past. Therefore, you will usually have many more LCD TVs to choose from at a given store. If this trend continues, you may not have an option to buy a Plasma TV. So the bottom line is let your eyes be the judge and don’t be afraid to buy a low priced TV, even if it’s an LCD TV. For more information on this subject you may want to read “Power Consumption Trends in Digital TVs produced since 2003”, written for the Consumer Electronics Association, dated February 2011. 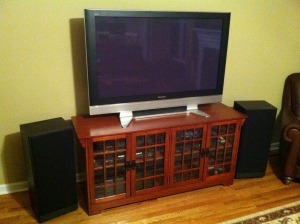 Please feel free to call Belco at 770-455-4556 or visit our website at www.belcoinc.com for more TV information. Let us know if we can help you with your television system installation whether it is a power outlet, surge protector, cable jack or an over the air TV antenna. Trustworthy Contractors Are Hard To Find Is an Underground Pet Fence Safe?